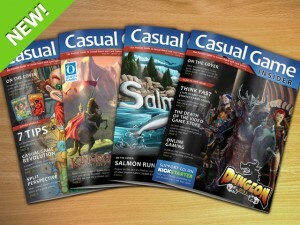 Casual Game Insider Magazine is looking to fund a second year of their magazine and have a Kickstarter campaign in order to do so (hopefully. They're more than halfway there, though). Casual Game Insider is the perfect resource to learn about great casual games, read up on interesting topics related to casual gaming, and share with your friends to get them interested in gaming! CGI is published quarterly in print and digital formats and focuses on casual board and card games that are relatively easy to learn, quick to play, and fun for all ages. The first year of publication was funded here on Kickstarter, and we have had a very rewarding and successful year. In addition to our many direct subscribers, we now reach 2,000 game stores with the help of 3 major game distributors (ACD, GTS, and PHD). We also have the magazine available on the iPad through a 3rd party app (HP Magcloud).